I used to love reading magazines before the turn of the century, when we got a PC and the World Wide Web sucked me in. Lately I've been disgusted with how much time I spend "surfing" nothing much and waiting for content to load. In a quest to recapture a kinder, gentler, simpler, happier time in my life, I've been stepping away from the computer and flipping open magazines. 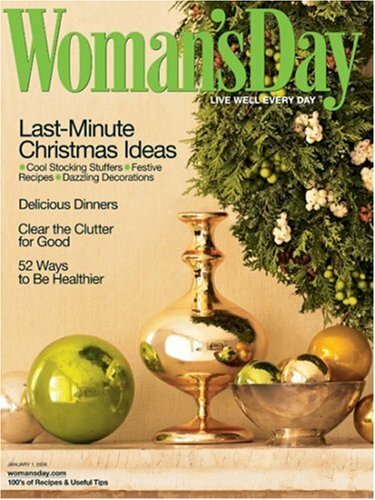 I've read Woman's Day ever since I can remember, with the exception of 1999 through 2007 when I didn't subscribe to anything but two newspapers which my husband reads. Yep, I've stopped reading the newspaper too. The old one eyed monster on my lap had me in a stupor. We have a new treadmill and I'm doing a thirty minute training session on weekdays, while reading magazines. I read the january 2009 issue of Woman's Day two days in a row. It worked out perfectly, cover to cover. I will say it seems thinner than I remember, but I used to be thinner so maybe everything is relative. Eat Dessert, Carbs & Snacks and Drop Lbs. I loved the pictures and short informative articles. The older I get, the less patience I have to read long passages. This suits the impatient little kid in me very well. I will be trying the frozen canned pears pureed with ginger recipe. A real favorite in this magazine is the page of quotes, It is sure to bring a smile or teach you something about life. They also always have cleaning tips, health topics, diet and exercise solutions, true stories, beauty hints, inspirational articles, soul nourishing tips, recipes, recipes and more recipes, family/children, flowers, end of the magazine article to make you think about life, and gardening hints. If you want to find a cover story fast, they have an "on our cover" section in the index. In Every Issue there is a shopper's guide and a recipe index. The articles are helpful and in the March 2002 issue they had an article on how to be less stressed. They also had an article on PCOS which is apparently more common than we women think. The beauty sections show you the newest fashion and you can decide if you want to adapt your style to the trends. Always seems rather chic. The recipes are not difficult and seem practical. Even the advertising in this magazine is colorful and fun. A Very "American Gal" type magazine. Nothing fancy, just real life.